You search progressiv and innovative music with intelligent lyrics? Download this Album and your Dreams come true !! 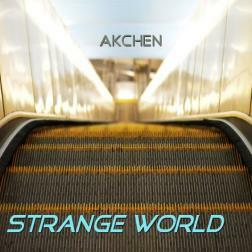 Dive in the world of AKchen and see how strange is the mankind!! I do not stop to tell how you are talented in creations! Any song you make is unique, sometimes so special and ? And what about your skill about finding and singing on crazy soundtrack the others could do . Your songs are really fresh and inspiring. The title of the album fits perfectly to our days. What a versatile talent is Andrea. Present at every musical way and produces much. Uniquely vulnerable voice that every time touches my heart and soul. An honor and a joy to work with her. This album is already in a musical direction, which Waterval takes up later and condensed. On the other side of the mainstream, a fascinating sound world opens up here. I am glad that I could contribute to this.